I have seen the work that Enviromate does with regard to material donations for projects and wondered if you could help. I have a disabled son who will be 30 yrs old this May and with his conditions we all, including hospital staff, never expected him to reach this age. 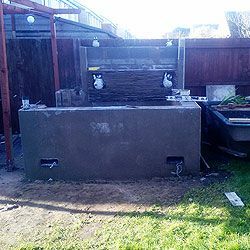 To celebrate his birthday and the arrival of Spring, we are creating him a surprise sensory garden and have managed to build a fish pond for him but am trying to find scaffold boards to edge the pond with and also raise the flower borders so that he can reach them from his wheelchair. Unfortunately we are now low on funds to complete the project in time. If Enviromate could help in any way we would be very grateful. I have never asked for anything before but after seeing your work, I thought it would be worth speaking with you.